Edited to add: I’ve written about this topic for an online publication where I talk more in depth about the division of responsibility and practical advice for parents. You can find that HERE. There are a lot of different recommendations, theories and opinions on how to handle Halloween candy and honestly, to each their own. Today I only hope to offer my perspective, as a nutrition professional who works with individuals with disordered eating patterns and eating disorders as well as a mom of three little Halloween lovers. I recently came across an article entitled, “Why Forbidding Your Children to Eat Certain Snacks Won’t Work”. The article cited a recent review of research encompassing 25 years of evidence showing that extremes just don’t seem to work when feeding children. The researchers’ recommendation is to teach a more moderate approach in a structured environment. You can read the article by clicking the link on the title above (and I highly recommend that you do!). The article makes reference to Ellyn Satter’s Division of Responsibility, which I have blogged about in the past. That structure would include having boundaries around when meals and snacks are eaten, while serving and encouraging consumption of a wide variety of foods at each eating event. I do think it’s wise to remember patience with your child as he/she is learning and discovering new foods and to let them learn at their own pace, while trusting them to know how much their body is needing and asking for. So where does candy, or treats in general, fit in? To be clear, they need to fit. 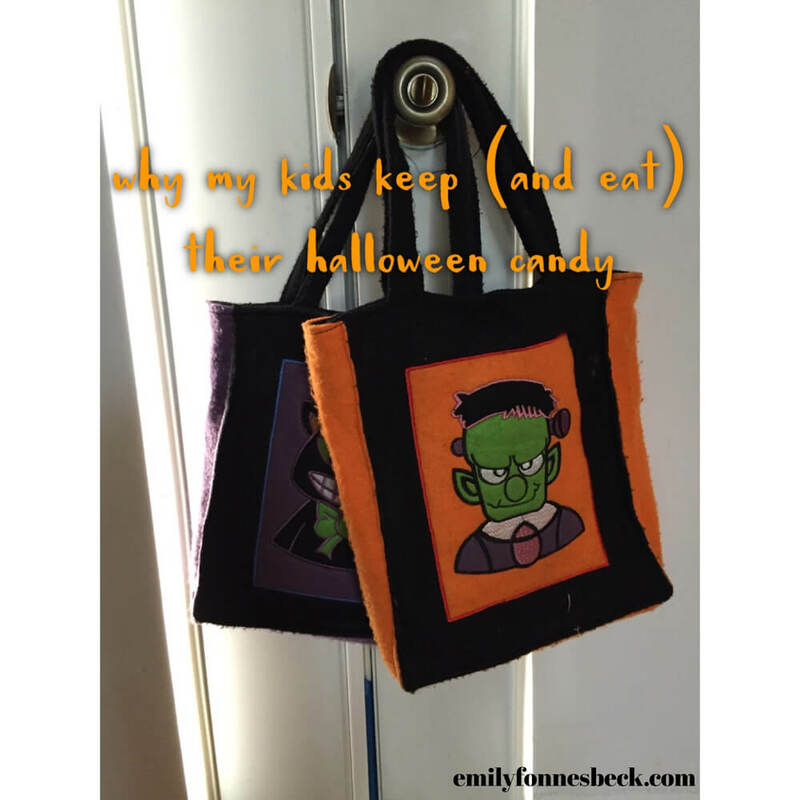 I don’t think it’s realistic to expect our children to go without candy or treats when they will be places all their lives where treats are offered to them. We could debate about whether they should or shouldn’t be offered treats so often, but that would mean lack of acceptance of reality which can just make you anxious, feel out of control and powerless. I am much more interested in teaching them how to make wise decisions rather than restrict them. Also, if they aren’t offered any at home and they never learn how to moderate their choices, their behavior could turn chaotic when they finally are able to have it. At some point, all of us need to figure out how to make decisions that are in our best interest. We don’t do our kids any favors by being overly restrictive and militant OR overly lenient and disinterested. I’ve discussed the need to avoid extremes in thinking and behavior, and our kids will learn how to do that from us. My goal for my kids, and any client I work with, is not to make them uber-healthy eaters, but instead confident eaters, built on a foundation of self-trust. I’ve worked with many adults who wish they had never gone against their own natural intuitive signals in favor of diets or lists of rules. It’s then that decisions are made out of restriction, deprivation and fear rather than trust and wisdom. In fact, current research shows the best treatment for disordered eating behavior is to find a place for all foods in the person’s meals and snacks. The assumption is often that if an individual has a chaotic relationship with a particular food, they should avoid it. We actually find this increases disordered eating behaviors. Unconditional permission to eat has been shown to lessen preoccupation with food in general. Restriction actually causes chaos, rather than being a solution for it. When kids know they can have what they want, within the boundaries of meal and snack times where wholesome foods are available, it’s more likely they will be able to make a decision which is in their best interest rather than out of fear, deprivation or restriction – just like any adult. While this process will take time and require patience and perseverance (for a child or an adult), it’s well worth the effort to find a peaceful and trusting relationship with food. A few weeks ago we celebrated a family birthday. Ice cream and cake were served and my oldest son turned it down. I asked him why, out of curiosity, and he said he “just wasn’t in the mood”. He had been at a scout day camp all day and told me they had a few treats and he just didn’t feel like having more. I think the reason he was able to turn down the ice cream and cake was because he was able to listen to his body, while also knowing that this wasn’t the last opportunity to have cake and ice cream before we never let him have it again. Make sense? I don’t share this story to toot any horns, only to show that this is what I feel a healthy relationship with food is: not a list of rules, no shame or guilt or restriction, just the ability to be flexible and ride the natural flow of life (something I am really happy to see this son in particular be able to do). The question here isn’t whether candy is healthy or not. The question here is what approach is effective and helpful. To be honest, there are many times I would much rather see my kids eat something else, but to tell them what to eat just doesn’t achieve what I hope for them. Parents controlling their child’s food intake only teaches them to rebel against the rules. Setting a structure for balanced meals and snacks, with treats after meals or as part of snacks if they want them is what I feel the best approach for our family, and my general recommendation to you. So my kids will keep their Halloween candy. They will likely eat more than usual on Halloween night and then we will put it in our candy cupboard for them to enjoy for the weeks to come. I’ve found that we can keep a carton of ice cream, a batch of cookies or a bag of candy in our house for weeks or months without feeling the need to have it all right now. That’s exactly what I hope to see – kids who are able to moderate their own food choices, without obsessing, feeling guilty or shameful about food. Great post! I love how you said you want to build confidant eaters in your children – I think that is a great approach! Great post and perfectly written as usual!! I have been mastering this in my own eating, just need to breathe a little more with allowing some treats for my 22 month old more. Don’t want him having the same issues I faced most of my life. No need to restrict, just teach moderation and being intuitive. 🙂 I know that was a big Mom win for you with JC as well! Kudos! !